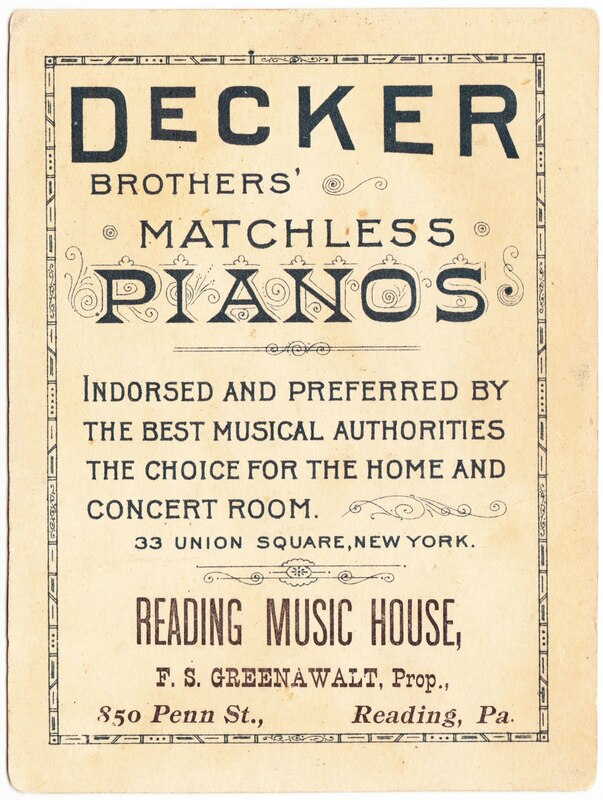 This old Victorian trade card for Decker Brothers pianos and the Reading (Pennsylvania) Music House measures 3½ inches wide by 4⅝ inches tall. And, no, I don't know what naked toddler with a full head of hair has to do with pianos. That's how it goes with Victorian cards. Spooky nights are used to selling baking powder. Little children are used to sell coffee. And cats are used to sell soap. 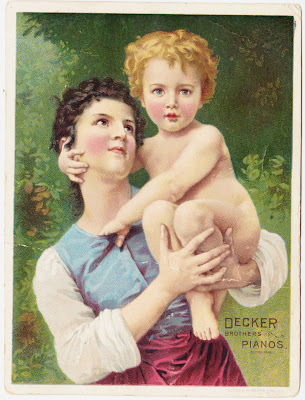 Decker Brothers was in business from 1865 until about 1900, which helps to date this card somewhat. The Decker Brothers were David and John. According to Wikipedia, their pianos were "known for their exceptional quality in knowledgeable piano circles, and The New York Times wrote that they had 'a wide spread and enviable reputation for their superior quality'. However, they did not achieve the notability of some of their counterparts, specifically Steinway & Sons and Chickering and Sons, even though widely acknowledged as being equivalent in quality." Indeed, this trade card states that Decker pianos are "indorsed and preferred by the best musical authorities." The other business listed on this card is Reading Music House, located at 850 Penn Street in Reading, Pennsylvania. The proprietor was one F.S. Greenawalt. I couldn't find much about the music store or Mr. Greenawalt, which isn't surprising, given that this piece of paper is 110 to 140 years old. "Joseph P. Knapp became the [American Lithographic Company's] first president and his old Knapp Co. became the art publishing branch of the new firm in 1900. Together they became the largest printers in the United States controlling about 80 percent of the market. They printed all types of material including early chromolithograph postcards such as the official cards of the 1893 Columbian Exposition for Charles W. Goldsmith. By 1900 most of the separate printing facilities of all these firms had been consolidated into a single plant." 1. The Decker Building was designed by socialist-anarchist architect John H. Edelmann, who might have provided the inspiration for fellow architect Louis Sullivan's maxim "form follows function." Another aside: The Decker Building was the home of Andy Warhol's studio, The Factory, from 1968 through 1973.